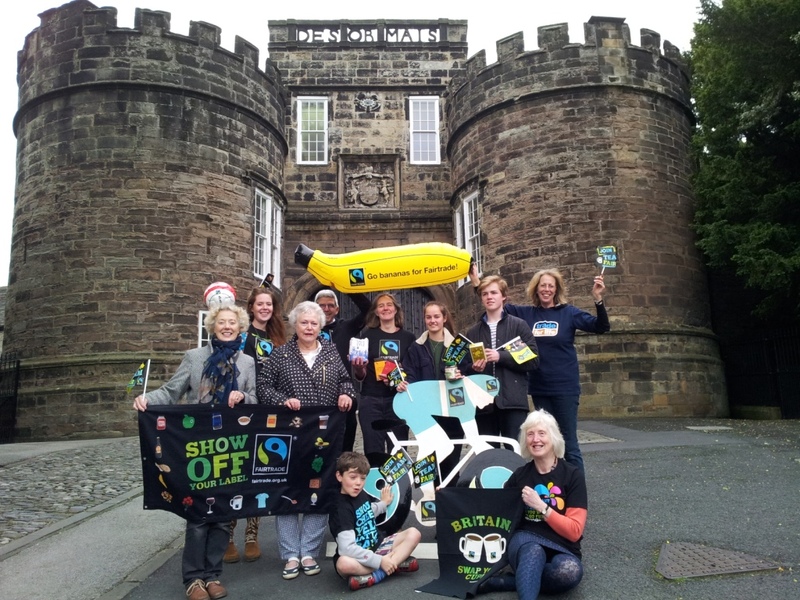 After much hard work and commitment by Skipton Fairtrade Initiative, Skipton has officially been designated as a ‘Fairtrade Town’. This is a significant event in a campaign to raise awareness of ethically produced and traded goods to both the public and local businesses, which first began, in a small way in the town, almost 15 years ago. It is just fourteen months ago since the present group, chaired by Liz Roodhouse, Coordinator of Craven Development Education Centre in Skipton, and comprising Councillor Eric Jaquin, Dawn Brailsford, Fairtrade Coordinator at Skipton Girls’ High School, Chantelle Conlan, Fairtrade Coordinator at South Craven School and several members of local churches, was convened to prepare an application to the Fairtrade Foundation. A number of goals were required to be met to gain Fairtrade Town status. The resolution passed by Skipton Town Council to support the initiative and to serve Fairtrade tea and coffee at its meetings and in its offices was applauded by the Fairtrade Foundation as being a ‘comprehensive and firm commitment’ and ‘really encouraging’. Other goals were to gain the support of local shops and catering outlets that sell and serve Fairtrade products and to encourage local employers and community organisations, such as faith groups, schools and colleges, to use them. In addition, the group was required to organise events to involve public participation and stimulate press coverage, in order to promote knowledge and interest in the aims and principles of Fairtrade. In its feedback to the application, the Fairtrade Foundation particularly commended the group for its hard work and wrote: ‘It is great to see such a long-standing campaign which has continued to innovate through time and undoubtedly reached a great many people in Skipton.’ The Fairtrade trail created by Skipton Girls’ High School was praised as a brilliant start to creating a Fairtrade Directory. The Fairtrade Foundation concluded by warmly congratulating the Skipton group for ‘a fantastic achievement’. Shoppers at the Merrion Centre in Leeds may well have been surprised to find some fruity friends to greet them last Saturday. 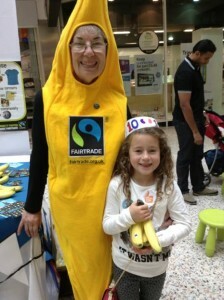 Fairtrade Leeds supporters gave away over 200 free Fairtrade bananas and invited young visitors to make their own banana themed party hats. “We are celebrating 10 years as a Fairtrade city and wanted to involve Leeds’ citizens to join in the fun!” said Hannah Langdana, chair of Fairtrade Leeds Steering Group. Fairtrade means better prices, decent working conditions and fair terms of trade for farmers, workers and their communities. When you buy a product with the Fairtrade mark it means that workers’ rights and the environment have been protected, and that farmers have been paid a Fairtrade Minimum Price and also an additional Fairtrade Premium to invest in their business or community projects. “We were able to tell lots of parents about how Fairtrade has changed Aimeth’s life and were impressed with the beautiful hats that the children made” adds Hannah.